Blü neon UV series by Adriano Rodrigues. A lot of people ask me how I create my neon series, I have done several over the years. First to last (Neon Dreams, GENESIS, VIXEN, MINX, Luminous, and Blü). It's always tricky trying to redesign the "wheel". And, what I mean by that... it's difficult to try to create modern Art that no one has ever seen before. It's an expressive outlet for me. I work closely with my significant other and my family to create these hyper reactive colors shoots. I want to draw the viewers attention no matter how distracted they may be. The galley below is several images using an iPhone 8 to capture the process behind the latest series Blü. This was rather tricky, we needed to make the water glow and have the model in the frame without having to worry about injury. From start to finish, this series took roughly 9 hours between makeup, water, and posing. It always amazes me what you can accomplish in your bathroom or even in your apartment. A lot of people when they view images on Instagram for example, think you have to have a high-end apartment or a special studio. You'd be amazed what creativity and a mixture of sweat can accomplish. If you ever have any questions about the neon UV series we create here at adrianoINK.com please don't hesitate to ask. I hope to hear from you all. Thank you for your time. 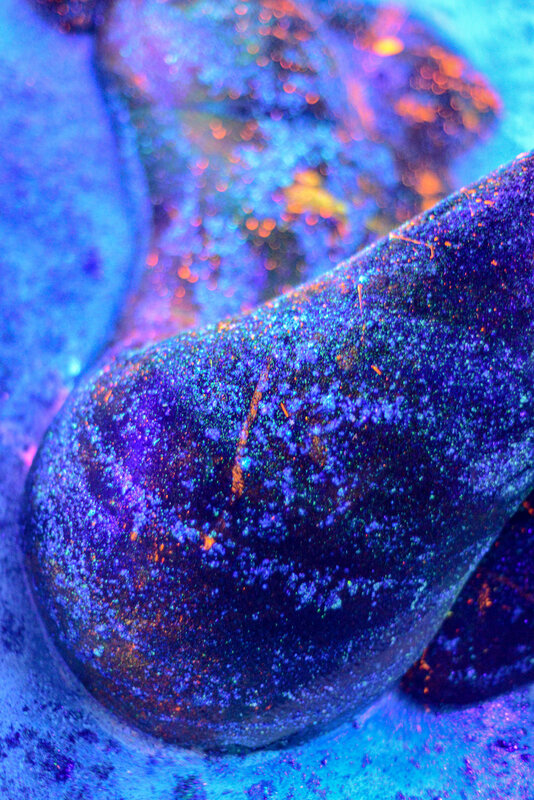 I found an amazing article regarding neon UV photography. If you're looking to do neon UV photography of your own, I'd recommend this article by Brandon Woelfel and the 5 tips of neon photography which could help you start in the right direction to create something of your own. Professional finished images of the Blü series. You can view the full series in our "SELECTED ART" section on our website.